We offer cheap car hire Malaga with meet and greet service, no excess, no deposit, no fuel charges, no hidden costs, all according to our VERY transparent and very customer friendly general conditions. To Compare car hire Malaga on a like for like basis can be more complicated than you would think. As opposted to our ALL INCLUSIVE PRICES, most car rental comanies and price comparison websites does not clearly inform about the TOTAL COST involved in the offered price. Further down on this page you will find extensive information on the major points to be aware of and to look out for, before comparing car hire Malaga. It is essential that you do your research well in order to make a car hire Malaga price comparsison properly. Even on the car hire comparison websites or bokers who advertise that they will find you the cheapest car hire Malaga, the conditions will very drastically from each offer/supplier and are often misleading when it comes to what is included and what not. If looking to find cheapest car hire Malaga comparing prices we advise you to read this page - Especially if you want to book your car hire Malaga with NO EXCESS and NO DEPOSIT and NO FUEL CHARGES. FUEL POLICY: NO FUEL CHARGES OR "REFILLING FEE"
Please read more about fuel charges and "refilling fees" below before comparing our rates and before choosing car rental supplier. WE DO NOT SELL add-ons to you on arrival. Our rates are fixed and ALL INCLUSIVE with NO OPTION to buy ANYTHING. 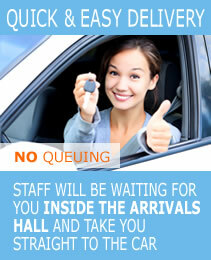 You will be met by our staff INSIDE THE ARRIVALS HALL and lead directly to the car. + MORE ABOUT FUEL POLICIES AS A "HIDDEN COSTS"
One of the "hidden costs" that many companies force the client to pay on arrival is to prepay for a full tank of fuel.. The price/litre charged is normally much higher than the current market price/litre at any petrol station in Malaga. This is normally NOT advised clearly in advance when you book the car. In addition to the profit made seeling a full tank at a higher rate per litre, the car rental company will make another profit on the 15-20 litres of fuel left in the tank when the car is returned, if the fuel arrangement is that the car must be returned "as empty as possible" and with "no refunds for unused fuel". If you add the higher price paid per litre, let's say an average of 20-30€ per full tank + the 15-20 litres left in the tank when returning it, you end up with AN ADDITIONAL EXTRA COST OF SOME 35 - 50 €! You must understand that this is done deliberately and as part of these companies' pricing strategie. That is why you do not realize this extra cost before arriving at the desk to pick up the car rental at Malaga airport. You SHOULD EXPECT this type of "hidden cost" (or other hidden costs) as part of the deal when dealing with the majority of car rental companies operating from Malaga airport. + CAR HIRE MALAGA FULL TO FULL WITH "REFILLING FEES"
If you are looking at an offer with full full fuel policy or car hire Malaga return full tank please remember to double check that there is no fuel fee or "refilling fee" involved. Many offers advertising "car rental Malaga return full tank" or "car hire malaga full full fuel arrangement" or "car hire malaga no fuel charges", STILL involve a fixed "REFILLING FEE" of some 30-40€ - they will simply charge you for the "service" of refilling the tank. Good people. Obviously this is not advertised with capital letters when you book the car. 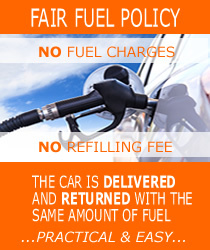 Many local car rental companies in Malaga have now turned to applying this type of fuel policy in order to justify a cheap price for car hire, leading the client believe that there will be no extra cost for fuel since it is advertised car hire malaga full full fuel or car rental malaga return full tank. Lastly, we would like to point out that companies that apply this type of fuel policy will NOT be very easy to deal with in any other aspect of your dealings with them - especially regarding any type of economic aspect concerning damages, charges, payments, refunds of deposits and so on. 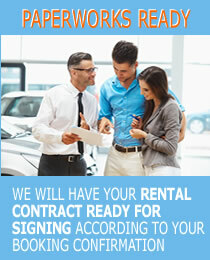 You may want to consider this aspect as well before choosing car hire in Malaga. AVOIDING all this sort of "hassle" and surcharges on arrival is easy...try us! 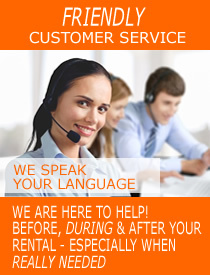 - we give a good and genuine service to each and every client. + GOOD TO KNOW REGARDING "FULL INSURANCE"
Be aware that the way many companies use wordings like "full insurance" in their advertising is very misleading as well, which is obviously the purpose. Especially the term CAR HIRE MALAGA WITH FULL INSURANCE is a very used term by most companies, giving you the idea that everything then is included. Far from true - it is infact a rather wake term that does not specify whether it only refars to the PAI or if there is an insurance excess if the car is damaged or scratched. Vaious very large and well known comparison websites (we don´t remember the name but think it was something like "holidaycartoes.com") do not even include the mandatory PERSONAL ACCIDENT INSURANCE or PAI (damages towards third party) in their rates. This means that you will be "offered" this PAI at the desk when picking up the car...and you will have not choice but to purchase it. It is required by law. The reason for these exclusions in the insurance conditions is simply to allow the car rental supplier in Malaga to sell you this on arrival, leaving you no other option but to purchase the PAI insurance at the local car suppliers desk. It is obviously a mutual agreement in between the broker (comparison site) and the car supplier (the owner of the car) that will deliver the car, allowing to offer a seemingly lowest price car hire Malaga. The terms "INSURANCE EXCESS" and "DEPOSIT" are by many companies being used extensively to confuse the client. They both serve the same purpose, which is that you will be charged this amount as a guarantee for such and such damages not covered by the insurance. Many comparison websites take advantage of this misconception, by advertising car hire malag with no excess, BUT with a high credit card deposit required which is not clearly explained or advertised. Cheap rates for car hire in Malaga with "no excess" will MOST LIKELY require a credit card "deposit" anyway. These "Deposits" normally in the range of 800 - 1.200€ (or more for larger cars) - to be paid on arrival. It is in fact just ANOTHER CLEVER WAY OF CHARGING EXCESS by calling it a "deposit". And we do not "sell" you anything on arrival. That the price shown to you when booking the car hire will be the price to pay on arrival. Meet and greet car hire Malaga airport is the term used when the client is being met personally by a representative or staff inside the arrivals hall and lead directly to the car which will be ready nearby. This proceedure is applied to ALL OUR DELIVERIES (also to deliveries outside of opening hours 21:00 - 08:00). Meet and greet delivery is the quickest possible delivery with NO QUEUING and NO SHUTTLE BUS to off-site offices involved. When comparing our all inclusive rates with those of other companies we would like you to take into consideration that this service IS INCLUDED in all rates and save you both time and hassle. Some companies offer this as an optional extra called "fast lane" or "airport delivery" or "personal delivery in arrivals". Please consider this added value which is included in our rates - large car rental companies and suppliers in Malaga could only dream of offering their clients such a service. Remember thEspecially after having travelled 4-5 hours already it knowing that someone will be waiting inside the arrivals at Malaga airport with the paperworks ready, and that you will be guided straight to the car? If you compare our rates to those of other companies, or with those of car hire comparison websites, where a courtesy shuttle bus is involved as part of the deal, please note that the ONLY authorized courtesy bus stop at Malaga airport is NOT outside the new terminal T-3. It is situated in the "tunnel" outside the "old terminal building" T-2 which means a good walk. All in all, whenever a shuttle service is involved in your car rental Malaga you should expect to be spending at least 1 hour before the car is delivered to you. 6. a "discussion" with commission based staff at the desk regarding extra insurances and/or credit card deposits etc. etc. Since companies that operate from off-site offices normally avoid to inform clearly about the shuttle service and with that, the long delivery time involved in their services, we thought you might find it useful to take this into consideration be clear on this point before deciding where to book. To our best knowledge we offer the cheapest all inclusive car hire Malaga if the price comparison hire Malaga is made on an equal basis i.e. with the same insurance cover, no excess, no deposit, free mileage, free airport delivery, extra drivers and free child seats included. On most car rental comparing websites that offer price comparison car rental Malaga it can be quite tricky to obtain exact information regarding the insurance conditions, deposits, exceptions/exclusions, fuel policy etc. without spending hours. The seemingly low price shown to you when you book is normally NOT THE TOTAL RENTAL COST if what you are looking for is car hire Malaga with NO EXCESS or risk including free mileage, and with drivers and child seat included. There is obviously a deliberate intention in not being transparent about the extra costs that you will be charged on arrival. Please always remember that in order to make a like for like price comparison on car hire in Malaga, all additional costs such as insurance excess waivers, deposits and fuel charges would need to be added to price cheap car hire Malaga that you are comparing our rates with. This is what we promise...and these are the promises we keep!